Ventoux AOC Wine Region in Provence, France. During Crush, winemakers all sport the tell-tale sign of deeply purple tinted hands. 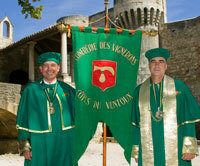 Photo courtesy YR.
Confrérie des Vignerons des Côtes du Ventoux roughly translates to the Brotherhood of Ventoux Winemakers. Vignerons is one of those wonderful French words. The word itself sounds like Patron and Vine combined. It evokes the associative alliteration of “patron of the vines.” And what is a winemaker, avigneron, if not a patron of the vines? Someone who cultivates, nurtures, tends and harvests fruits brought forth from deep-rooted vines. And what is wine, if not an art? AOC Ventoux is the wine region right next to the celebrated Châteauneuf du Pape. Not as famous as its neighbor, the area’s wineries nonetheless produce outstanding wines. “We just have to say that we’re next to Châteauneuf du Pape for people to recognize what we produce. It’s the same terroir. The same vines,” explained the proprietor and winemaker André Berthet-Rayne of Domaine Berthet-Rayne in Cairanne. 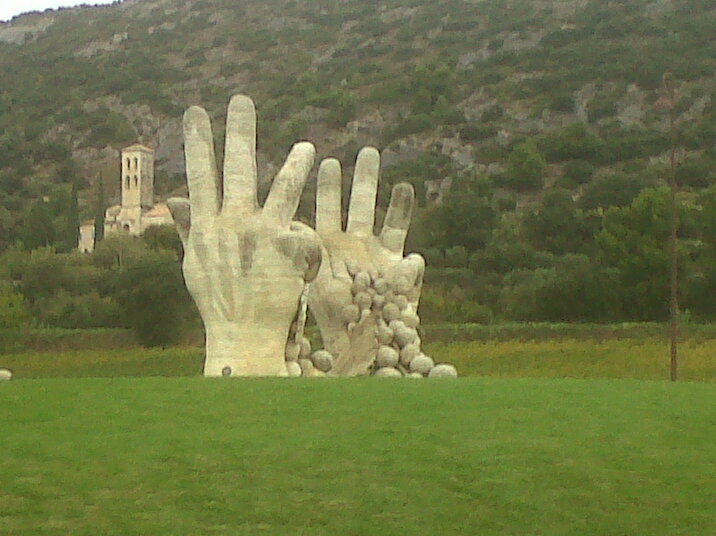 He gestured to his fields of Bourboulenc, Grenache, Roussane and Clairette with the deeply tinted purple hands that are the tell-tale signs of the winemaker during crush. Castel Mereio by Domaine Berthet-Rayne, Cairanne, comes in both red and white. He also produces AOC Côtes du Rhônes wines including a Domaine Berthet-Rayne Castel Mireio 2008 from old vines, approximately 40 years old. This red has top notes of mushrooms, offers a waft of musky and finishes with a balanced acid, fullness in the mouth. It also comes in a white. Vignerons-Cairanne. The Confrérie was revived in 1982 and today is the ambassador for Côtes du Ventoux wines. It is made up of a small group of wine lovers who are expert on wine and the soils. Newly inducted members have to pass a tasting test, do some oath-taking and then they are allowed to receive the taste-vin engraved with the Poudadouïre, the symbol of the brotherhood. There are several distinctive soil types in the Ventoux wine region, a region that has more wineries than all of New Zealand combined, according to Morgan Williams. Williams is a New Zealand native and winemaker who currently works at Château Unang, a 9th century château and vineyard in the village of Malemort du Comtat. He will tell you straight up that none of the locals buy Châteauneuf wines. Not when you can get a Ventoux wine that’s just as good and not nearly as expensive. Altered Safre is one of the Ventoux soil types and exhibits a light, sandy texture combined with pebbles. Ochre sands, (red earth), and gypsum, (white rock), are also to be found on the natural steps that form the “Comtat Terraces,” the geological formation between the plains and the Mont Ventoux mountain from which the AOC region takes its name. At the base of Mont Ventoux, in Bedoin, home to many noted wineries, the alluvial fan presents a variety of soils – brown, red and white -which lend themselves to growing the highly characteristic wines. Mazan is a choice starting point for a journey of discovery of Ventoux wines, and not just because the Marquis de Sade, in 1772, held the first theater festival in Provence in the village of Mazan. [Nearby Avignon now holds its annual, world renowned theater festival during the summer]. It is also a wine heritage site with archeological digs unearthing wine storage amphorae from ca. 40BC, the Augustan era. But most importantly, Mazan offers a number of outstanding and easy to access wineries and wine paths. Domaine des Cambades is a bit off the beaten path but still close to Mazan. Proprietor/winemaker Hervé Vincent will graciously meet you at the crossroads if you call in advance and tell him that you are coming by. Domaine des Cambades’ vintage, Il Etait Une Fois makes a stop at the winery, every bit worthwhile and an absolute must. For some oenogeek activity, an afternoon at the Château Pesquié is one to put on the list. The winery, located in Mormoiron, offers a path around the lovely 18th century château itself which is a beautiful specimen of Provencal architecture. The path offers sweeping views over Mont Ventoux and Mormoiron, a charming local village. Along the path you will see the AOC Ventoux grape varietals: Carignan, Cinsault, Syrah, and Grenache for the reds and rosés and Clairette and Roussanne for the whites. The path is about 1 km and takes approximately 45 minutes to walk. The cellar also shows cross-sections of the estate’s soils. Carignan is a grape very present in the Côtes du Ventoux appellation. It is Spanish in origin and is cultivated to produce low yields. Winemakers expect to get qualities of robustness, color, power and liveliness from the juice. For three generations the family has been making wine at Domaine du Bon Remède. Lucile and Frederic Delay say that 2010 will be a good year. They use 40-50 year old Grenache vines to blend with their 90% syrah, 10% Grenache Secret de Vincent vintage 2008. Their 2006 is all sold out and not even a wine cellar visit at the winery will get you a bottle, let alone a case. Their barrel and cask storehouse make the trek out to the winery still worthwhile. Domaine de Fondrèche is another to mark down on your map. It’s at the intersection of two ancient Roman roads. And, of course, Domaine des Anges, at the top of Notre Dame des Anges hill, with its splendid views of Mont Ventoux, lend a Ventoux wine tasting trip its deep red, dark fruit flavor, perfect for crush and the Autumnal season. *Editor’s Note: Truffle season, “Rabasse,” in Provencal, begins in November.